Rebby & Sean’s summer Ignite Glass Studio Wedding had one of the most original floral palettes that we’ve designed to date! The most vibrant & colorful blooms were used throughout their day to create a super fun and energetic ambience. From the bouquets, to the flower girl crowns, to the centerpieces; vibrant pops of color created a stunning floral palette every way we looked. The blooms consisted of fuschia & peach garden roses, lavender sweet pea, purple stock, coral ranunculus (personal favorite!!! ), light blue delphinium, purple baptesia, peach stock, and light purple scabiosa. Rebby & Sean’s Ignite Glass Studio Wedding ceremony took place on a beautiful Summer Day outside in their courtyard garden. The backdrop to their ceremony featured colorful hand blown circular glass pieces. They opted for minimal decor for their ceremony so the artful glass pieces would really pop. After all, it’s our goal to enhance your ceremony space, not compete against it! We tied petite & colorful floral clusters to every other chair for the perfect pop of floral so as to not take away from their eye-catching backdrop. For the reception, Rebby & Sean choose (our favorite) modern stone pots for their centerpiece vessels which we packed full of unique & colorful blooms! The simplicity of the vase with the colors really worked in the raw space that is Ignite Glass Studios. Touches of gold were interspersed in the votives, flatware, and table numbers made by the bride. Hope you enjoy the photos below captured by Nicodem Creative! 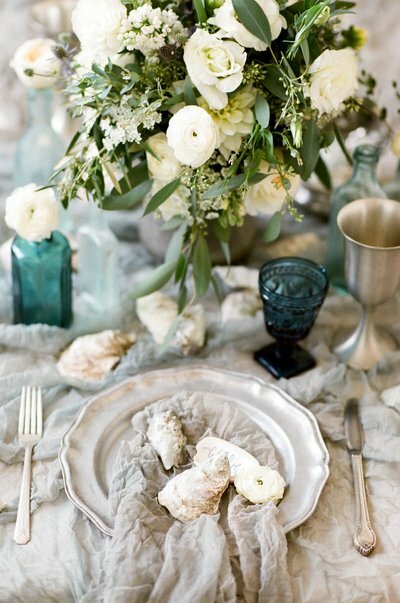 This wedding sure has us dreaming of Summer on a cold, gray day like today!